Bentley will present the second generation Continental GTC convertible at the Frankfurt Auto Show next month. Taking cues from its GT coupe sibling launched last year, the new Continental GTC builds on the highly successful foundation of the previous cabriolet, which premiered in 2006. Bentley’s design and engineering teams have improved virtually every aspect of the iconic convertible with an uncompromising focus on quality. 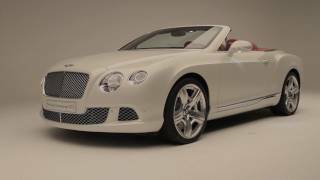 The 2012 Bentley Continental GTC convertible is powered by a powerful 567HP 6.0-litre, twin-turbocharged W12 engine with a max output torque of 700Nm (516lb ft). This luxurious cabriolet completes the sprint (0-100km/h) in just 4.8 seconds and has a top speed of 195mph. You can buy this Bentley for $212,800! Bold, contemporary, sculpted design employing advanced production technology. Sensuous, luxurious, hand-crafted cabin with class-leading infotainment. Coupe-like refinement with unrivalled comfort and practicality. More powerful 6.0-litre W12 engine with FlexFuel capability, delivering exhilarating performance. Uprated chassis for a more dynamic and engaging open-top driving experience. (Crewe, England. 24 August 2011).The second generation of Bentley’s iconic Continental GTC convertible will debut at next month’s International Automobile Exhibition (IAA) in Frankfurt. While the first Continental GTC was elegant and understated, the sharper radii and assertive stance of the new model delivers a more contemporary and muscular presence. Advanced manufacturing techniques produce aluminium front wings without the need for seams or welds creating the look and feel of a coach-built car. Twenty-inch wheels are now standard with three styles of 21-inch wheel, a first for GTC, available as an option, reinforcing the distinctive, sporting stance of the new Bentley. The four-seater luxury convertible features a new, even more spacious and sumptuous hand-crafted cabin, with soft-touch leather hides, an extensive range of wood veneers, cool-touch metals and deep-pile carpets. There are 17 standard soft-touch leather hide colours with six colour split combinations, complemented by a range of seven veneers, all produced by Bentley’s talented craftsmen and women. A wider track, front and rear, sharper steering and retuned suspension provides a more exhilarating and class-leading drive. Bentley’s advanced all-wheel drive system features a new 40:60 rear torque bias (compared with 50:50 of the original GTC) minimising understeer during hard cornering and allowing the spirited driver to manage the car’s line and balance via precise throttle control. Wolfgang Dürheimer, Chairman and Chief Executive, Bentley Motors. The Bentley Continental GTC is now available to order and first customer deliveries will begin in late 2011. Pounds Sterling inclusive of 20% VAT. Euro price does not include individual market taxation rates. US Dollar pricing is exclusive of individual state taxes. Unique jewelled headlamps with LED daytime-running lights. More upright matrix radiator grille and new ‘double horseshoe’ rear profile first shown on the flagship Bentley Mulsanne. New interior with a bold, sweeping dashboard and instrument panel finished in premium soft-touch leather. Choice of 17 hide colours, six colour split combinations and seven veneers. Distinctive ‘cobra style’ seats for added comfort and enhanced rear cabin space. A new touchscreen, 30GB infotainment system introduces advanced satellite navigation with dynamic route guidance, seven-digit postcode entry and Google Map compatibility (market specific). Audio systems feature the latest wide-frequency Balance Mode Radiator speakers as standard. FlexFuel capability – runs on E85 biofuel, petrol or any combination of the two. 0 – 60mph 4.5 secs (0-100 km/h 4.8 secs). 0 – 100mph 10.9 secs (0 – 160km/h 10.9 secs). Top speed 195 mph (314 km/h). ZF 6HP28 transmission with ‘Quickshift’ system that cuts shift times by up to 50% and enables double downshifts. Increased front and rear track improves grip and stability. Advanced ESC system fully exploits the potential of the more powerful W12 engine and improved chassis. 20” ‘Five Spoke’ alloy wheels with optional 21” wheels in ‘Five Spoke Two-Piece’, ‘Seven Spoke Elegant’ and ‘Ten Spoke Propeller’ designs.